An upcoming traffic switch will temporarily split westbound traffic on the New York State Thruway in Westchester County. Tappan Zee Constructors (TZC) is scheduled to slightly relocate two lanes of westbound traffic near the new bridge’s Tarrytown landing during the overnight of Friday, Nov. 30, weather permitting. The new traffic pattern will temporarily split the four northbound/westbound lanes on the New York State Thruway (I-87/I-287), allowing TZC to continue roadway work in the area. 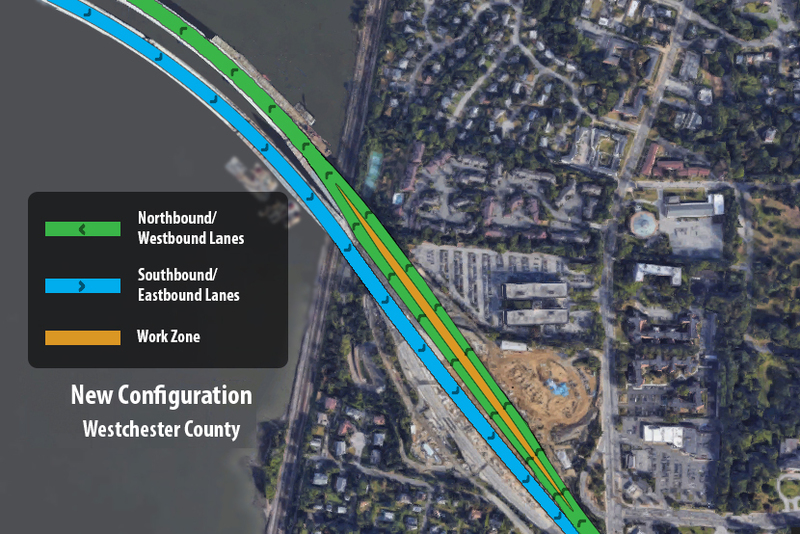 The two pairs of lanes will merge on the Governor Mario M. Cuomo Bridge just after the Westchester approach, shown in the graphic above. To create the new traffic pattern, up to three lanes of traffic will be temporarily closed during the overnight operation, beginning at 10 p.m. on Friday, Nov. 30. All lanes and ramps are scheduled to reopen by 10 a.m., Saturday, Dec. 1. The project team will soon release further details about the temporary closure. Motorists are also being advised via Variable Message Signs along the Thruway. Once the operation is complete, all four westbound traffic lanes and shoulders will be reopened in the temporary configuration. This traffic pattern will remain in effect until the pertinent roadway work is completed in early 2019. The anticipated roadway work includes replacing the Thruway’s existing driving surface with new precast concrete slabs and pavement.